CINCINNATI – They're painting the town red. And blue. And green. And all the other colors of the rainbow. This summer, local youth and professional artists will paint 23 enormous murals around Greater Cincinnati. 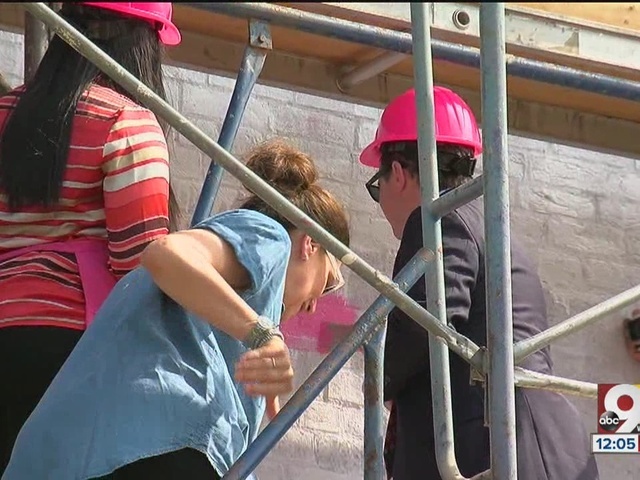 Mayor John Cranley was on hand Monday morning at Pleasant Street in Over-the-Rhine for the ceremonial first brushstrokes of the “Swing Around Rosie” mural featuring local songstress Rosemary Clooney. ArtWorks employs 143 apprentices (local youth ages 14 to 21) to paint the new murals and engage in community art projects around Greater Cincinnati. The paid apprenticeships also engage participants in activities like financial literacy training, goal-setting, and team-building. From Monday through mid-August, 12 new murals will be painted in OTR's Main Street district alleys through the New Lines project , a partnership between ArtWorks and Keep Cincinnati Beautiful (KCB). New Lines mural sites will be located between Liberty Street and East 13th Street in Goetz Alley, Plough Alley, Enon Alley and Bland Alley. For more information on ArtWorks, visit the organization's website here .